So much to talk about after the Cycling Liaison Group [CLG] meeting on Monday 31st January not sure where to begin so I’ll go for “systematic”, working through the agenda in posts to bring clarity rather than confusion, hopefully. I first cycled the towpath when I lived in Hampton and worked in Barnes 25 years ago. The ride from Chiswick Bridge to Hampton Court and back via Bushy Park is a jewel in the Richmond crown and one reason it’s such a great place to live. But why is the surface so poor in places yet so good in others? The Council say it’s a footpath, so can’t be an official cycle route, so isn’t engineered, or maintained, as one. 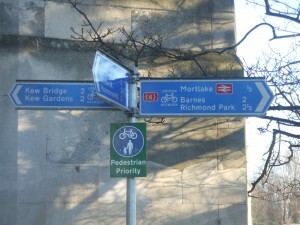 The Cycle Tracks Orders appear as Scheme 5 in the London Borough of Richmond-upon-Thames [LBRuT] Cycling Capital Budget 2010/2011, allocated £5,000. £1,800 was spent by December 2010, which is the cost of the time the council officer has worked on it. Apparently the towpath has been talked about for at least 10 years with money set aside to do something. I’ll ask how much and for what. 8 sections are listed between the Borough boundaries towards Putney at one end, Kingston and Hampton Court at the other. Actually, there are 7 as Teddington Lock to Kingston was dropped after the shared use path was installed. The 1st 3 sections are continuous, from Putney to Hammersmith Bridge and Chiswick Bridge to Kew Bridge. 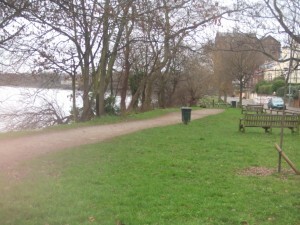 The next sections are between Richmond Bridge and Twickenham on the other side of the river, Richmond Bridge to Ham Street on Surrey and then between Kingston Bridge and Hampton Court Bridge. It’s not all bad news. The Draft RCC Priority List identifies the towpath between Hammersmith and Chiswick bridges as something to sort out, even with the engineering challenges of a route routinely flooded at Hammersmith Bridge and through Mortlake. And, despite everything, I didn’t sense any intention on the part of people at the meeting on Monday to affirm footpath status by putting up no cycling signs and enforcing them, I think recognising this would be as expensive and even more problematic than the cycle track orders. What I did hear were the same complaints as the Tamsin trail in Richmond Park, used as the example of what happens on shared paths: speeding cyclists frightening pedestrians, running over young children, dogs and elderly ladies. So, what now? The Chair put it over to the next meeting of the CLG in April while all the relevant councillors are contacted for their view. In the meantime I’ll ask the cycling officers some more questions, hopefully some of which will be yours. Watch this space. This entry was posted in All Posts, Campaign, Consultation, Cycling Liaison Group Meeting, manifesto and tagged Campaign, Consultation, Cycle Lane, manifesto, mortlake by nick. Bookmark the permalink.